Eight years ago, two Clint Eastwood war movies — Flags of Our Fathers and Letters From Iwo Jima — opened within months of each other. So two opening on the same day doesn’t seem that far-fetched. But what are the odds that one of the two Eastwood movies that open this Christmas Day would be directed by Angelina Jolie? Jolie played the mother in Changeling, Eastwood’s chilled, grim missing-child melodrama from 2008. For Unbroken, her adaptation of Laura Hillenbrand’s best-selling nonfiction account of WWII war hero Louis Zamperini’s experiences, Jolie appears to have absorbed the front-facing resolve shared by many of Eastwood’s period movies. It’s big and long and kind of puffed up and paved with craftsmanship, sentimentality, and generic notions of fortitude and perseverance. It’s the best picture of 1948. That said, Unbroken has more polish and better writing than Eastwood’s own American Sniper, which is based on a Navy SEAL’s memoir of his four tours in Iraq — subtitled The Autobiography of the Most Lethal Sniper in U.S. Military History. The muscularity in Jolie’s moviemaking comes sheathed in an elegance that doesn’t appear to interest Eastwood right now. His is a hard, gruff, no-frills, strangely basic movie intended to honor its subject, Chris Kyle, an even-keeled Texan whose sharpshooting prowess amassed him a staggering tally of kills and nicknames like “The Legend.” Kyle died before the film went into production, a fact the movie reserves for a title card at the end — and the heaviness of the loss hangs like an anchor around the drama. This movie is drowning in duty — to say nothing of hoary storytelling devices and one embarrassing scene after the next for Sienna Miller as Mrs. Kyle. The film opens with Kyle (Bradley Cooper) supine on a roof in Iraq, his ear cradled against his mounted rifle, eyeing a shifty-looking child in his crosshairs. Will he take the shot? Patience, please. The script, by Jason Dean Hall, orders a childhood flashback, in which Kyle’s father has taken the boy hunting and praises his son’s marksmanship as a “gift.” An adult Kyle goes on to ride broncos and, with some amusement, toss his unfaithful girlfriend from their home. (“I do this to get attention!” she says. “Don’t you get that?”) He catches a Nightline report of the 1998 bombings of the U.S. embassies in Dar es Salaam and Nairobi and hyperventilates toward the television in a mild rage. By the next scene, Kyle is at a recruitment office looking to “be of service.” So it’s off to SEAL boot camp, doing scissor kicks and push-ups in weighted vests in damp sand at night, taking verbal abuse from the drill instructors. We’re simultaneously ever closer to and further from the boy in the crosshairs. And yet there’s more. At a busy local watering hole, Kyle meets Miller’s character, Taya, seemingly eager to get into it with the first Neanderthal who ogles her. Kyle’s charming wit disarms her, of course, but not before her insults provoke his defensiveness (“Why would you say I’m self-centered? I’d lay down my life for my country”) and then his valiance. There’s a cut to him holding back her hair, after she flees the bar to puke. Next come the courtship (phone calls, trinket-winning trips to the carnival) and the marriage, which is interrupted (or enriched) by the news that he and his team are headed to Fallujah. Then, finally, it’s back to the discomfort of those crosshairs. You understand what the film is doing. It’s raising the stakes. It’s giving us, in Taya, an emotional conduit. But her character and the writing around her are one-dimensional. The minute you see her in that bar, your interest starts to flag, because you presume that you’re stuck with this woman and with Miller’s high-strung emotionalism, that it’s only a matter of time until Taya’s on the phone with Kyle, saying, “I’m making memories for myself.” The movie hits its bottom before that, when one of those phone calls ends because, just as she’s telling him they’re having a boy, Kyle and the troops come under attack. This incident might have really taken place, but American Sniper is full of these sorts of jammed-together moments. This is the second time this season Miller has been shown bawling into a phone over a besieged husband. Her part in Foxcatcher was much smaller, but she had a good scene partner in Mark Ruffalo. Here she spends a lot of her scenes alone. The movie is interested in Taya only as she relates to Kyle’s turmoil. Once he returns home and is in stoic despair, she becomes less a character than a emotional tourniquet. Eastwood takes pains not to paint Kyle as either a yahoo or an artist. Sniping is work for Kyle, and it can be dull. Kyle takes himself off roof duty to get in on the action of house-to-house calls in the hunt for the terrorist Abu Musab al-Zarqawi. The film is also, fitfully, a modern war thriller, with a pair of suspenseful set pieces involving Kyle’s opposite number, who becomes the villain, taking out U.S. fighters as he eludes capture. But you lose patience. What’s it about? The filmmakers might say it’s about the Cost of War and the sacrifice Kyle made. But most films about war are about costs. There is some mindfulness here in the domestic scenes, such as when Kyle, near his psychological bottom, sits in front of a turned-off television almost wishing for another Nightline report of disaster — something to get him back to war with someone other than himself. Even that scene brings out the constant imbalance here between the terrible kick of and jones for combat and the cruel stress of its post-traumatic hangover. Evening out those two sides never happens. The film feels structured in a way that suggests Eastwood is doing more accounting than directing. You don’t feel American Sniper build toward anything. It’s too mournful for even the narrative to go up. The whole movie is one long denouement. There are two big problems with this. The first is that Cooper is so good that you wish Miller would leave him alone — or that he would leave her. He’s made everything about himself meatier — his face, his midsection, that Texas accent. I don’t remember an actor going this convincingly from the shallows of disposable comedy to the depths of character work, from seeming to have no appreciable talent to having more than most of his peers. Cooper’s hustled everybody. He might be at a peak right now, and what’s gotten him there is that he knows what he can do — and you sense that he can do more. In American Sniper, he’s not interested in acting the heroism. He’s performing the toll of the work. He’s the one aspect of the movie that doesn’t feel beholden to Kyle’s life. He’s embodying survival. Kyle argues that he saved a lot of lives. Cooper can brag that he saved Eastwood’s movie. The second problem is that the most fascinating thing about Kyle’s postwar civilian life is the therapeutic social work he’d begun doing with other soldiers, one of whom shot and killed him in early 2013. The movie doesn’t bother with this at all. So to flash it up on the screen the way it’s done at the end is like getting doused with cold water. Kyle’s death is a terrible, ironic cost of war. You’d much rather see a movie wrestle with that tragedy. On that front, like Foxcatcher, it loses its nerve. Rather than tell a dark story of a moment in time, it opts to tell none. Jolie has a story with Unbroken. It’s just so triumphant and so anonymously old-fashioned that it almost doesn’t matter who tells it. The movie savors the pre-chewed prestige of Hillenbrand’s book, while using a classical flashback structure to teach good Christian lessons about charity and forgiveness, with Louis Zamperini (Jack O’Connell) as the movie’s symbol. Zamperini, the son of Italian immigrants in Torrance, California, ran the 5,000 meters in the 1936 Olympics in Berlin (there’s even drama in his eighth-place finish), enlisted in the Army Air Corps as a bombardier, flew in the Pacific theater in WWII, and was captured by the Japanese and tortured at a labor camp. The movie opens on an American bomber under Japanese fire. It’s a tense, elegantly assembled sequence, orchestrated in tight quarters. Jolie really puts you inside the action: the bullets whizzing past (and into) soldiers, other planes falling out of the air, the camera swinging around the aircraft. You’re aware of how great the danger is. She has control of the stress and peril, maybe even the weather. The sky during this daylight sequence is sunny, bright, a blue that matches the ocean where the plane crashes, bringing Zamperini and two other surviving soldiers (Domhnall Gleeson and Finn Wittrock) down with it. They inflate a raft that becomes their home for a month and a half of shark-infested waters and bad sunburn. Zamperini spends two and a half years as a POW and becomes the pet of Colonel Watanabe, the flamboyantly abusive lord of the camp, who’s played by the Japanese pop musician Miyavi (one name for the number of dimensions in his acting). Watanabe berates Zamperini. He beats him with a bamboo stick and instructs the other inmates to sock Zamperini in the face. Or else. Of course, the marketing for the movie bears down on one image, of O’Connell holding a beam above his head under threat of death. You want to say it’s unfair that the movie gives away its crowning scene. But that scene appears to be everything to the movie: proof of superhuman resilience. The other men stop what they’re doing to watch the show, and even Watanabe is left to tremble and well up in awe of this wartime messiah. It doesn’t feel terribly mysterious what would draw Jolie to Zamperini’s story. It’s an obvious show of strength. Cinematographer Roger Deakins and editor Tim Squyres provide the gleam and rhythm to temper her interest in the exposure of sinew. 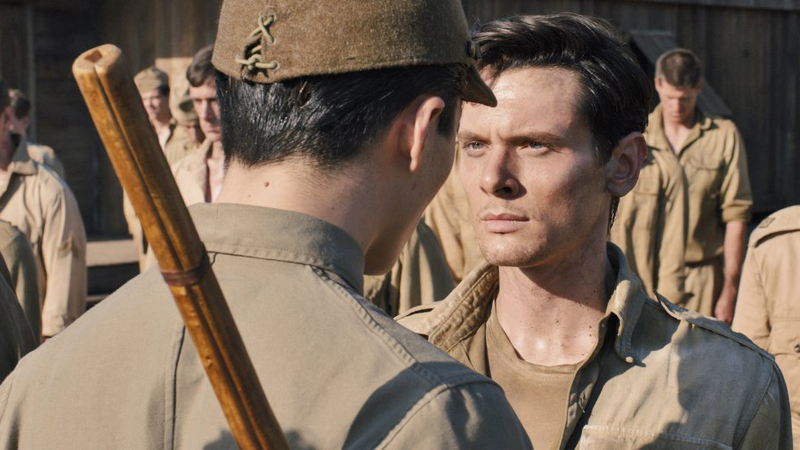 O’Connell, who’s English, appears to be the right actor for the misery called for in Unbroken. He suffers and quivers with dignity. But this movie is as uninterested in a person’s internal workings as Jolie’s acting is. Everything about her is externalized. That once was the Eastwood way, too, and it’s a respectable way of existing in the world, but it’s a limited style for dramatic storytelling. All the movie’s tension comes down to whether Zamperini can withstand Watanabe’s abuse, which is probably when it’s helpful to forget the title. Jolie’s previous film, In the Land of Blood and Honey, was a love story (written by her) in Bosnian and Serbo-Croatian, about two lovers on different sides of the Bosnian War. It’s the sort of thing you’d expect from a Hollywood-reared United Nations goodwill ambassador, a Harlequin war drama. But it wasn’t an embarrassment, either. What it lacked in voice and point of view, it almost made up for in gumption. Who but Madonna would’ve tried that? Conventionally speaking, Unbroken is a better movie. It’s ritzier-looking. It wants you to notice it, to give it things. Jolie might say it’s important. But Unbroken feels defensive. It’s a film she needed to show either to herself that she could make, or to her skeptical peers. She clearly adores Zamperini. (The movie ends with a featurette about the actual man, who died in July at the age of 97.) You can’t help but admire him, as much for what he survived as the good he did with that survival. But Jolie’s ideas of importance are so bland, so impersonal that you don’t stand a chance of being taken in by what she’s offering. She’s not yet 40, but she’s made the movie of someone twice her age and with none of the wisdom. Eastwood’s American Sniper doesn’t work, but it’s a neutral war movie by a star whose screen persona was forged on a vengeful keeping of social order. Eastwood is 84, and he’s mellowed now. He’s been working introspectively, self-challengingly, for more than 20 years. Dirty Harry cleans up and complicates his act. Jolie showed us something new this summer in Maleficent: an exciting mix of feminist principle and movie-star image bolstering. She was exploring the danger in herself. But you watch Unbroken and wonder why the woman who made it — the woman who’s been trying to do a Cleopatra movie for years — wants to be Clint Eastwood when she hasn’t even finished being herself. This piece has been updated to reflect that Louis Zamperini was in the Army Air Corps, not the Air Force.